I shared this painting in a blog post a few days ago, but I repackaged the video when I put it on YouTube in order to answer Chris's question, below. ChrisBreier asks: "45 minutes is quick for all of the detail you captured! Got any tips for painting efficiently?" 1. Get your measurements right. Spend a few minutes making sure the measurements in your preliminary drawing are accurate, so that you don't have to waste time fixing mistakes. These measurements may be just a few key lines, slopes, or anchor points, not a detailed drawing. You'll do the the real drawing and definition of forms with the brush. 2. Use a small number of colors. Fewer choices reduces confusion and increases the harmony in your color scheme. When you're deciding which colors to squeeze out on the palette, just include the ones you really need. This saves time, saves money, and saves cleanup. 3. Have your paints close to your painting. Set things up so that your painting is close to your line of sight and your palette is close to your painting. That will make it easier to achieve accuracy, and it will reduce the time you spend reaching back and forth from painting to palette. 4. Use each mixture in multiple places. When you mix a color and have it on the brush, don't just use it for one small spot. Look throughout your scene for other places to place that color mixture. Try to analyze the scene for similar colors or planes. 5. Use the largest brush you can. Start with the biggest brushes and work your way to the small ones as you finish. Those windows I painted first as big dark strokes and then painted the mullions to square them up and divide them into three smaller windows. 6. Paint from life under limited time frames. Painting from life always helps you improve your speed and efficiency, because it forces you to focus on what's most important, as life and light races on around you. If you attend a sketch group, try bringing paint instead of pencils. 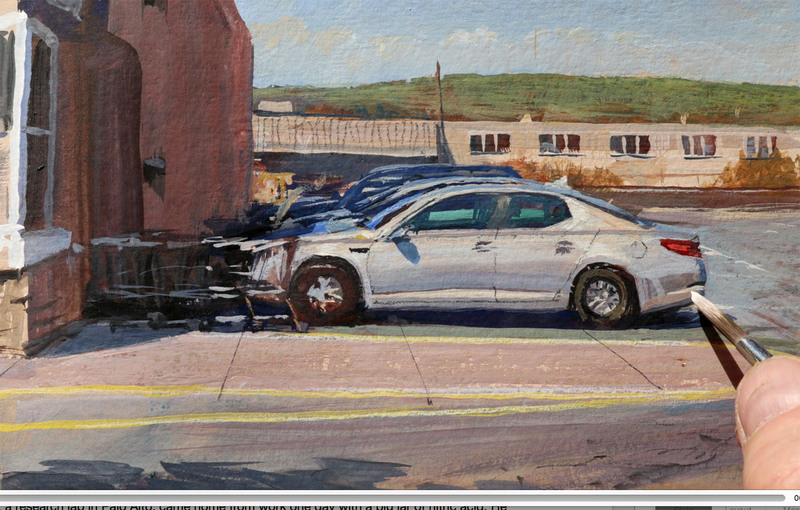 Of course, painting fast is not the highest goal of art, but an efficient technique often looks attractive. And it's always good to hone your skills and have them ready when you need them. #4 echoes Cezanne's excellent principle. Sometime with my students I will give them just the one color at a time. They place blobs where they need to be, and this aids also in judging distances and establishing composition. Then mov on to a second color, and so on. PS: Still love the monkey!! He always makes me smile. Excellent hints. 4 never occurred to me before. Love it. #1 PAINT IN A REALLY SMALL FORMAT! I love the video James, thanks for taking the time to answer my question! I think the tip that I need to work on the most is #4. I have a tendency to get caught up on developing one area of the painting which requires a lot of color changes. Working against a limited time frame seems to help too. I've been experimenting with breaking the time limit down into shorter segments. For example, I might give myself 10 minutes for drawing and 20 minutes for blocking in the basic shapes. So nicely done and efficient. I can't help but wonder about onlookers interrupting and taking up precious minutes. That would stress me out too much, especially knowing I'm on a narrow timeline. Seems they didn't teach me that word at Cubberley in 60, 61, or 62.